With the increasing demand for social, mobile, and big data applications, the creation and consumption of data continues to grow. Cloud computing is changing the way services are deployed and managed. The enterprise IT landscape is evolving rapidly and software-defined storage is critical to its successful transformation. 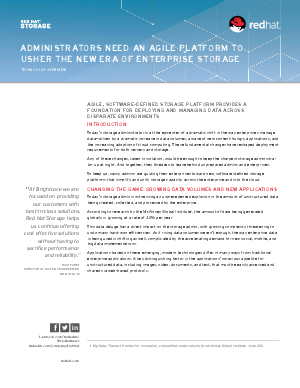 Read this whitepaper and learn how administrators are keeping up by guiding their enterprises toward new, software-defined storage platforms that simplify and unify storage capacity across the enterprise and into the cloud.